Come see us at Overland Expo East & West! When you operate in the toughest environments on earth, this is the series for you. This is a favorite of custom van builders and is a great choice for Sprinters and the like. Other sizes available in TRAVELLER, CLASSIC, EXPEDITION, LEISURE and LOW PROFILE series in SINGLE and DUAL compartment. This is our most popular model. 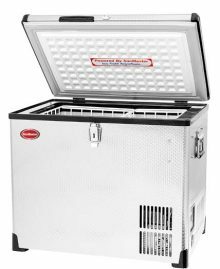 Take your Ice cream and frozen food on extended trips, keep the kids happy. Other sizes available in TRAVELLER, CLASSIC, EXPEDITION, LEISURE and LOW PROFILE series in SINGLE and DUAL compartment. Other sizes available in TRAVELLER, CLASSIC, EXPEDITION, LEISURE and LOW PROFILE series in SINGLE and DUAL compartment. See why so many have chosen Snomaster! Series 66L running 24/7 in our truck and love being able to just grab a drink or snack for the kids no matter where we are!! They are made of high quality products for a very reasonable price and you won’t regret your purchase! There is a lot of room to pack all of our drinks/food when we leave for our camping trips. Not only is their fridges a great purchase but it’s backed with outstanding customer service and a 5 year warranty so you can’t go wrong! Picked up the 42L model at the TAO Expo this last weekend. Haven't used it on an extended trip, but so far we move it. The guys were great to work with. Highly recommended. I got the huge snomaster 72L, half fridge half freezer. love this thing. a bit heavy when loaded but it's ultimate purpose is to be the built-in fridge in my Series IIa Ambulance conversion to a extreme off-road camper. But until that project is ready i don't mind hoisting it into the back of my D-Buggy and having the largest stash of beer and ice cream on the trail. Absolutely hands down the best product in my vehicle for adding comfort to the already harsh environments of the OBX islands! My fishing guide friends all want one for the boats! We primitive camp on islands and this is THE product to have for the options, warranty and value! Best camping fridge ever used! 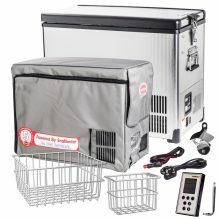 I have the 66L EX66D fridge/freezer in my over landing rig and I have been living out of it full time for 4 months now. We have driven 100s of miles of dirt road and have experienced 100+ degree days while traveling through Mexico and the SnoMaster is going strong. Gotta be careful not to freeze my cervesa. I sleep right above the fridge and am happy to report the compressor is nice and quiet. 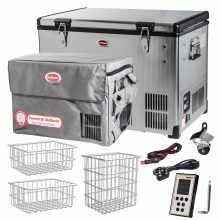 The ac/DC functionality has come in handy when staying places where I couldn't put my solar out, but could run an extension cord, and if no power is available the high quality insulation of these units allow them to stay cold better then most coolers do. I'm obviously happy with my SnoMaster and look forward to never buying ice again! "it has been an impressive piece of equipment. In particular, I am impressed with not just the outstanding quality of the fridge itself-which is superb-but also with the additional elements included in the sticker price. Getting a transit bag is a bonus, the wireless remote which I was initially skeptical of has proven itself to be very useful too. Across the board I'm glad I went with this fridge and think that anyone else in the market would be well served by giving SnoMaster a chance." Amazing quality and awesome customer service!